I’ve been meaning to post this for weeks now as they would have made the perfect little stocking filler or gift to take to a christmas drinks party. 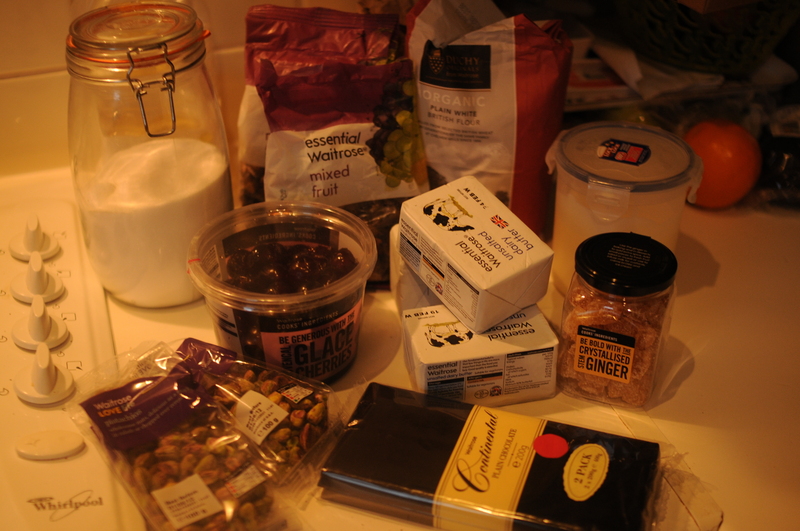 Sadly i’m a little disorganised/was super busy/it was bloody christmas so you’re only getting it now. Oh well, better late than never and all that jazz. Anyway, a few weeks ago my friends mum asked me to make a whole load for her to give to dinner party guests as a little gift. By a whole load i mean 85 so it was fairly hectic on the week before christmas. 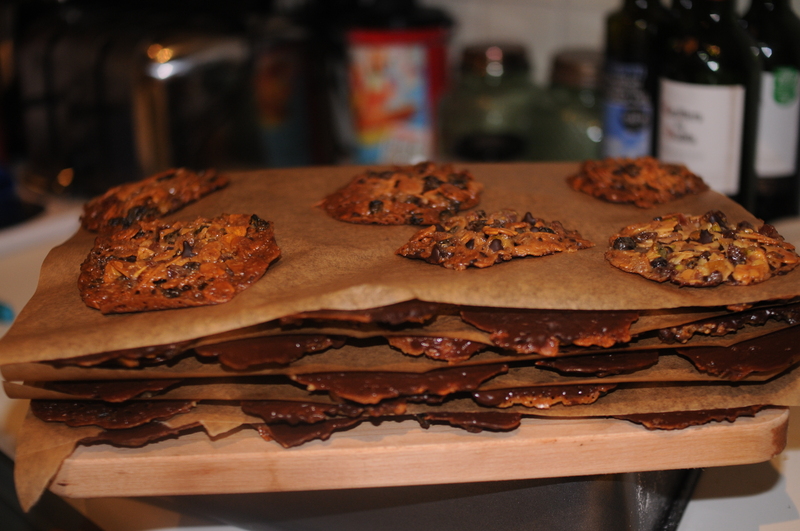 Having not made florentines for a really long time, i kind of underestimated how long it would take me to make 85 given that i only have a regular home oven so there were a few moments of cursing but on the whole it was worth it. It was also quite handy as they’re my mum’s favourite so i snagged a couple for her stocking, which was very well received. The mix itself is pretty quick to put together, and provided you don’t have to bake quite so many, the whole lot should be a fairly stress-free experience. I would recommend having 2 oven trays for this as that way you can have 1 tray in the oven whilst you’re preparing the other. First things first, preheat your oven to 190C/375F. 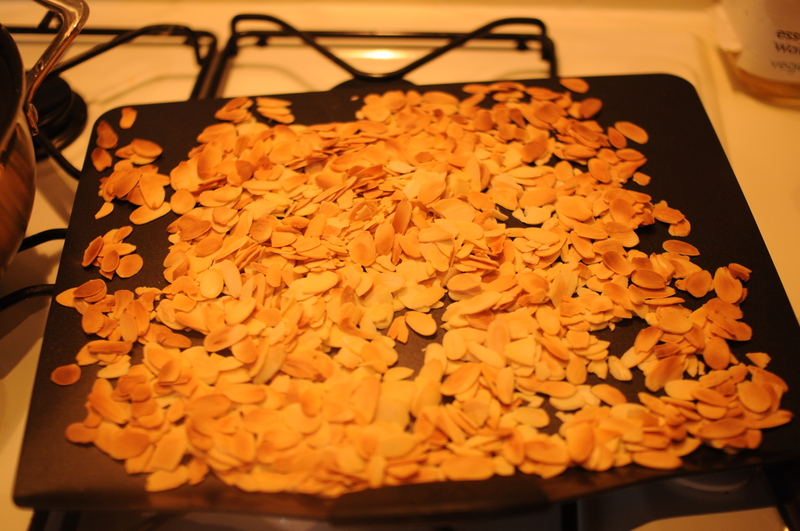 Lay the flaked almonds out on an oven tray and put in the oven until golden brown. Put the butter, sugar and flour in a pan and – without stirring – cook until a light golden caramel. If you need to, you can swirl the pan, just don’t stir it or the sugar might crystallise. If that does happen, a little splash of water might rescue it. 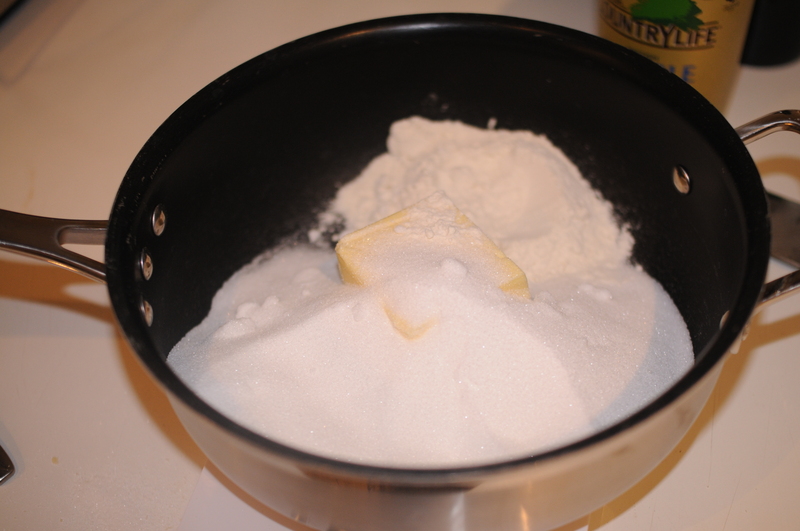 Once it’s nicely golden, take off the heat and add the double cream in 2 goes, stirring to prevent lumps forming. 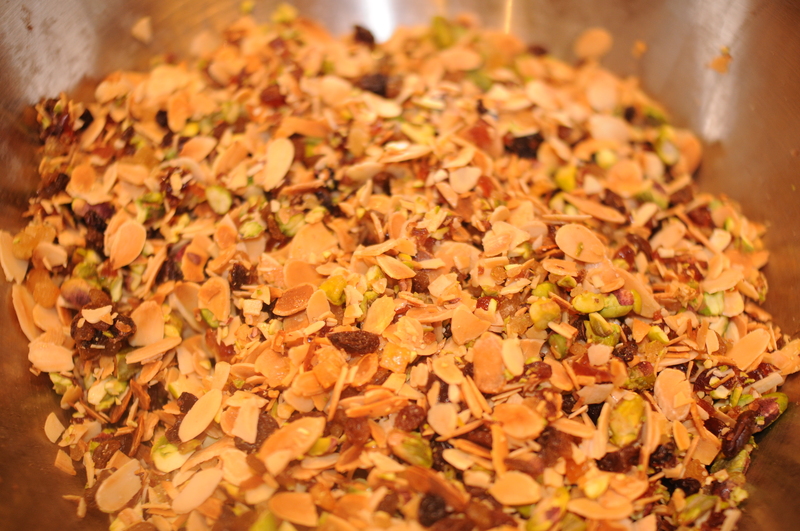 Rough chop the pistachios, glace cherries and stem ginger and add to the almonds and mixed fruit and stir it all together. Stir everything through the caramel. 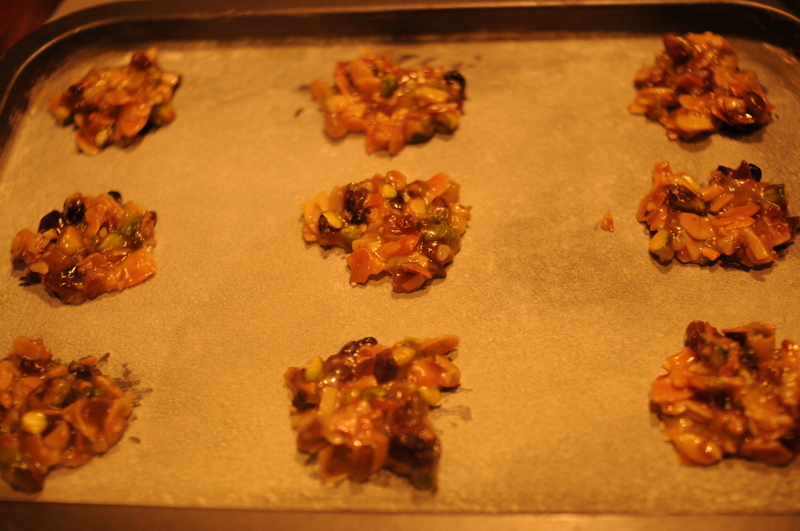 Brush an oven tray with melted butter and then dust with flour to prevent the florentines from sticking. Dollop teaspoons of the mixture onto the tray, spaced about 2.5cm apart and flatten slightly with the back of the teaspoon. 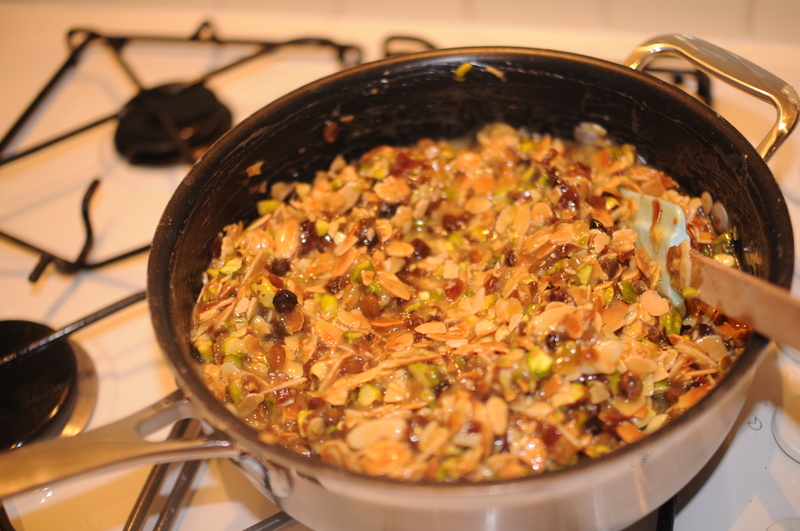 It will look like it’s not enough mixture but i promise you, it spreads like crazy so don’t be tempted to put more. Now all you have to do is pop them in the oven and bake until golden brown. Once they’re done, leave to cool on the tray for a couple of minutes to firm up before transferring to a wire rack to cool completely. Repeat until all the mixture has been used up. Melt the chocolate in a bain-marie (a bowl set over a pan of boiling water). You don’t have to use dark chocolate here, you could use milk, or even white, whatever you fancy/have knocking around the kitchen cupboard. 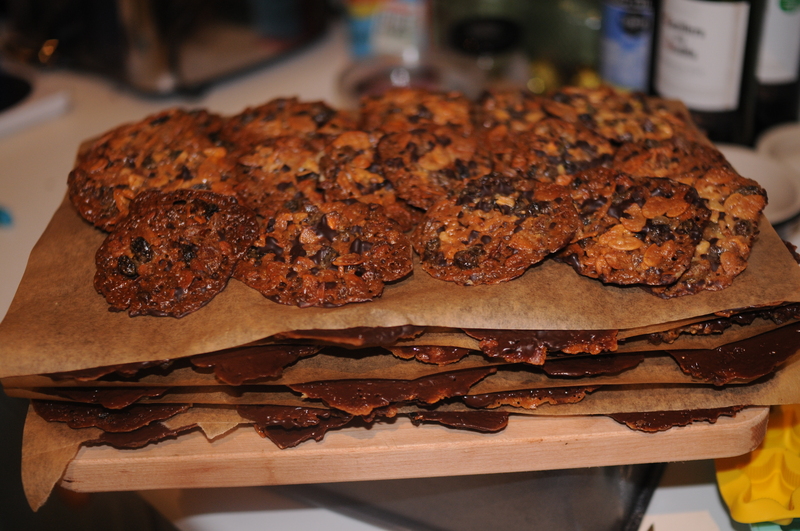 Using a pastry brush, brush the melted chocolate over the flat, underside of the florentines and leave to set. These store really well in an airtight container as long as you keep them somewhere cool (if they last that long). Yummy! I tasted and these were F A B U L O U S!! !